>> 5.11 Rush 12 vs 24 Which One Do You Choose ? ​5.11 Rush 12 vs 24 which tactical pack do you need ? If you are looking at buying a new everyday carry and are looking at either the 5.11 rush 12 or 24 then you've narrowed it down to two great choices. Does the difference in size really matter ? ​Yes absolutely it does. The Rush 24 is significantly bigger than the 12 as you would expect. The Rush 12 is arguably the most popular edc(every day carry) pack right now and has been for quite a few years. ​If however you are looking for a 3 day survival backpack with integrated Molle system that is built to a really high standard then the Rush 24 is the perfect bag for your needs. The 5-11 Tactical Rush 12 Backpack is a without doubt the go to edc bag for a lot of people. It combines some of the best build quality and features that you could ever need all in a small form light weight day pack. Used by a host of different people from all walks of life it can perform multiple roles whether that is as an edc, small hunting pack or i day hiking pack it really is incredibly versatile. The Rush 12 has a grand total of 16 compartments of varying sizes and for various different uses. The main compartment measures 18 x 11 x 6.5 inches, bottom front 12 x 9 x 1.75 inches and the hydration pocket is capable of holding 60 ounces. Despite it only being a 12 liter pack you can cram in a surprising amount of gear. 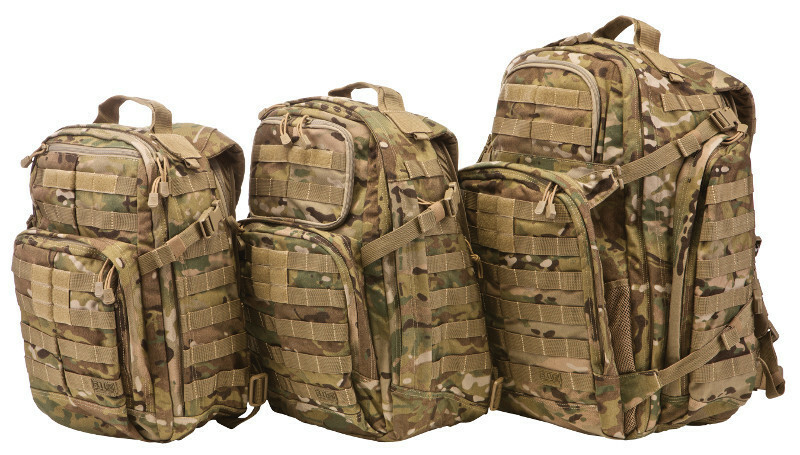 The additional Molle system is where you can really extend what you carry beyond a normal day pack. ​Molle gives you the option to mount extra storage externally to the pack. Being able to extend the carrying capacity makes these kinds of packs extremely versatile. ​Who is the 5.11 Tactical Rush 12 for ? The 5-11 Tactical Rush 24 backpack is aimed squarely at those in need of an over night pack that can handle even enough gear for 3 days. As you would expect it is a bigger version of the Rush 12. Built to the same high quality standards as others in the 5.11 range. 5.11 have built the majority of their packs from super resilient 1050D nylon which is more the most part water repellent. You get the same Molle/SlickStick webbing that is found on the Rush 12 so you can extend the storage capacity even further with add on's. ​With that kind of versatility you could fit the Rush 24 out to last even a week if you were travelling or hiking in a fairly minimalist style. Storage wise there are a host of compartments and pockets.​ A large main storage area, external zippered side pockets and stuff-it pocket. There is also a hydration pocket and a fleece lined eyewear pocket to help protect your glasses/sunglasses. ​Who is the 5.11 Tactical Rush 24 for ? The Rush 24 is for anyone who needs a pack capable of carrying enough clothing and sullies for at least 3 days. These packs are a lot bigger than most people realize before they buy them. Whats the difference between the 5.11 Rush 12 and 24 ? Clearly the size is the biggest difference between the two. With the Rush 24 you do get a more varied variety of the types of pockets available. But for the most part the 24 is just a scaled up 12. 5.11 Rush 12 vs Rush 24 which should you buy ? The decision is totally based on your needs. If you need a lightweight pack with enough room for your standard edc needs then the Rush 12 is the obvious choice. The 24 is definitely too big to be a day pack or everyday carry. It really comes into it's own once you need to start packing for an overnight up to a week at a push. It also makes a great range, tactical pack or hunting pack. The 24 is also a lot bulkier so if you are looking to carry one on a busy subway or bus on your way to ​school/work then it is not the most suitable pack, better to opt for the Rush 12 in that scenario.